Escape Winter, book now for the trip of a lifetime with our Mexico RV Caravan Tours. 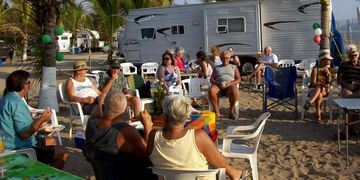 Caravanas de Mexico & Vagabundos del Mar can offer you better prices on RV Tours to Mexico, as we are not only the most experienced supplier of RV tours to Mexico, we are also a registered RV Caravan company licensed to operate anywhere in Mexico. (see Certification document). We know more about Mexico than any other RV Caravan company. 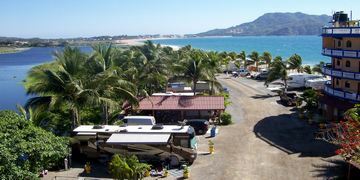 Caravanas de Mexico organizes tours and logistics for many other RV Caravan operators. We live in Mexico, and we know Mexico. People who have used us and other caravan companies always comment on how much better quality our tours our. That makes sense as we are Mexico Specialists, we do into operate anywhere else. This may be why Airstream uses us for their Mexico Caravans. We target both Snowbirds who want longer RV tours, and those who only have a few weeks to spare. For the 2020 season we are offering a Yucatan Tour, Colonial City/West Coast Tour, a 14 day Copper Canyon Tour, and a 30 day Copper Canyon/Mazatlan RV Tour tours for Airstream (see HERE). We have several longer term stay over options available. We also do caravans in French. We do not operate in Baja, but that may soon change. Yucatan RV Caravan tours are run in even years only. On our Yucatan RV Caravan tours we visit some more obscure Mayan ruins that hardly anyone else goes to, but are still impressive. 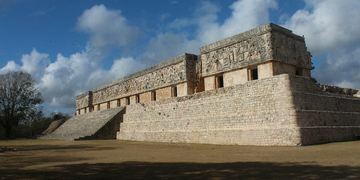 Yucatan trips are heavy on archaeological sites. This is the area of impressive pre-Columbian ruins and we go way beyond tourist-packed Chichen Itza. However, this route also provides plenty of beach time, nature and Colonial City Tours. We offer longer fully escorted Mexican RV Caravan Tours down to the Yucatan and the west coast. Traveling with others is safer. Not because of bad guys, but because Mexico has many physical hazards to larger RV's. Our trips feature both city and beach camping, plus an opportunity to explore Mexico’s spectacular Copper Canyon on some of our caravans (all inclusive included). We usually try to include one of Mexico’s wonderful carnival celebrations. Our Mexico RV Caravan Tours usually depart from either Nogales, Arizona or Mission, Texas. Depending on Wagon Master availability, there may be an option to exit at either Texas or Arizona for some of our tours, but an Arizona exit is the norm. All Tours & RV park fees are included, along with many high class meals. Many of our customers end up returning on their own to a favorite spot they discovered on our caravans. We are licensed to legally do many of our own tours, rather than having to contract them out. This means you are using a company legally operating in Mexico, not a gray market operator. We also give great deals for repeat customers, See here. We do have some very flexible options for those who wish to do partial trips or customized trips, etc. We will take people who have mobility problems, but we have to know what they are and determine if they are able to do some or all of our tours. We will discount them for tours we feel they cannot do. In some cases we will discount all tours and allow them to choose a la carte. Mexico's infrastructure for the handicapped is improving, but far from perfect. For someone in a wheelchair, it can depend on their weight. We had one customer in a wheelchair who weighed 90 lbs. No problem there, we could lift her, and her chair, across thresholds. Scooters may not be the answer, buses are not equipped to handle them and many streets are cobbled. We do what we can, however. Apart from tours, much of the enjoyment is in the journey itself and an individual with handicaps can enjoy that..
1) Safety. We are based in Mexico, we live in Mexico, we have the contacts in Mexico. Police, Customs, Road Service, bilingual Mexican guides. We know where it is safe to take RV's, both from a physical and security viewpoint. Since we are fluent in Spanish and have connections, we are constantly in touch with appropriate authorities with regards to road conditions, and any other issues. 2) Pricing Like most companies, pricing is per rig. We pay for RV Parks and use full hookup parks whenever possible. We do not cheap out by dry camping in Gas stations. If we dry camp, it is because there is no choice. Tours and many high quality meals are included. We also price in both US & Canadian dollars and you may pay in either. 3) No Middle Men Since we are legally registered to operate tours in Mexico, we do not have to contract out to other companies. We do provide services to competitors (we save some of the best for ourselves), but with many of them you are effectively paying for a middleman. We have our own network of qualified local tour guides. This means we can offer much more value for the money. For example, we have in the past provided all the tours for a competitor, and offered the same route & tours ourselves at 20% less. 4) Breakdowns or Accidents We have the means to provide assistance in Spanish and arrange to have someone stay with you if you are delayed, and help you catch up. 5) Border Crossing We have the experience to assist you with paperwork and sometimes facilitate matters if something is amiss. 6) Tour Guides We have an extensive network of local bilingual Mexican tour guides that we hire direct, not through a third party. 7) Green Angels We have connections with the Green Angels who are like AAA with semi police powers. We use them as tail gunners on much of our route. They can handle most breakdowns and issues we may have with police, etc..
You will require a vehicle permit (we assist) and you may have to pay a $200-$400 US deposit on your vehicle. This will be returned to you when you cross back into the US. Really large RV's may not be suitable for our Yucatan trips, you need to check with us first for advice. You will need passports, vehicle registration papers, Mexican vehicle Insurance, and you have to get a Mexican Tourist card (we assist). Please note you cannot take anything over a F350 or 3500 pickup into Mexico. Any size motorhome (Class A, B or C) is OK. If you have a lien on your RV you will need a letter of permisison from the lien holder. This is usually easy to obtain. If the RV is in a company name you will also need a letter of permission, even if it is your own company. All RV parks are included, plus plenty of tours & meals. We specialize in providing the sort of caravan you will not get with our competitors. We will take you to see sights you will not get to see with them, or on any other organized tour. We arrange tours for competitors, but save some of the more interesting and unusual stuff for our own customers. Our wagon masters are given far more leeway in what they organize, than is the case with most other caravan companies. We find most customers like a mix of the traditional organized tours with good meals, and some more ad hoc adventurous things organized by our Wagon Masters. Our customers safety is our first consideration. We utilize toll highways as much as possible. Your chance of having an accident is far reduced, and they are easier on your rig. There are not a lot of tolls on this route and some wagon masters may opt for utilizing the free roads on some sections he is familiar with if there is a consensus. Our tours are usually escorted by the Green Angels, the Mexican equivalent of AAA. They are excellent mechanics and are in radio contact with the police and Mexico city. They do not charge for labor, only parts. Certain tours with only a few rigs may not have Green Angel escorts, but they can be summoned in case of problems. You will be pre-notified if this is the case. As far as drug cartels are concerned, I have yet to see one in 10 years of RVing in Mexico. You are not a target, unless of course you are involved in drugs yourself. The dangers to tourists are highly overblown.